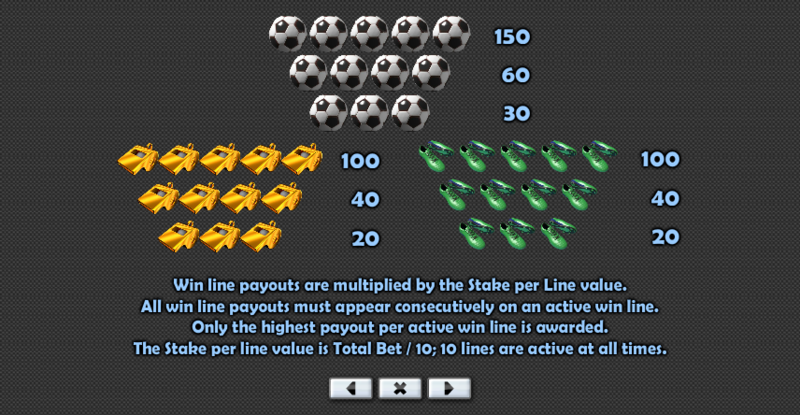 Online slots based on the beautiful game tend to be released every couple of years to coincide with either the World Cup of the European Championships; this year it’s the latter and hence we have this footie-themed game from Realistic Games. 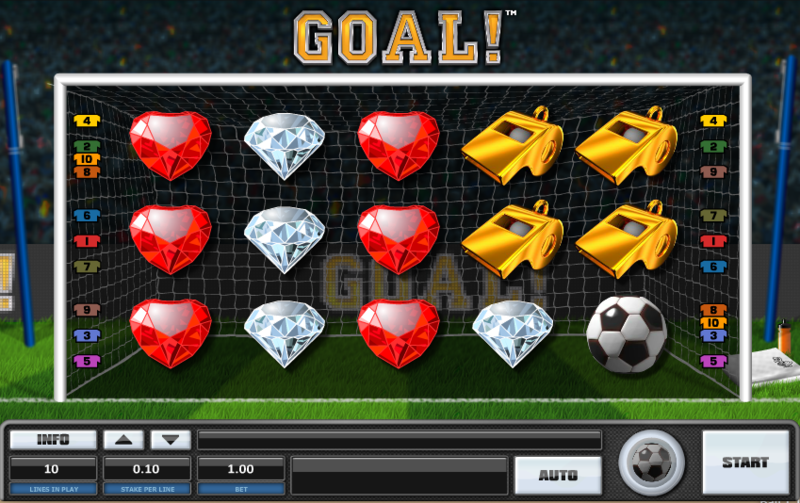 It’s called Goal!, it’s exclusive to Bet Victor Casino and it was previously called The Million Pound Goal as part of a Bet Victor promotion. Goal! is a five reel slot with three rows and ten fixed paylines; those reels spin within the confines of a goal frame on a lush green pitch and the Bet Victor banner moves slowly across the hoardings in the background. The symbols are a mixture of football-themed ones – referee’s whistle, a ball, some green boots and a silver cup – alongside some coloured gems including white, red, blue and purple. All the symbols can appear stacked on the reels. Winning combos can be formed with at least three matching symbols on a payline anywhere on the reels – they don’t have to start from the left hand side. There are no wild or bonus symbols in Goal! There’s only one bonus feature in this slot and it’s triggered in the base game when each reel contains a stack of matching symbols. The reels will now flash one at a time and you can stop this flashing or just wait for it to stop itself on one of the reels. One, two or three symbols on all other reels will now transform to match the selected reel. Goal! is a traditional game which may look a little on the basic side but which offers some smooth gameplay, amusing sound effects and a lucrative bonus feature. It comes with an RTP of 95.15%.